"A Dead Man's Chest was a great success. It's well thought out and so kept us all active the whole time. It's very good for getting everyone talking and having fun. None of us had played a mystery before, so we took some time to get started, but once we got going it went well." "My church "youth" group (ages 15-30) recently played A Dead Man's Chest, and the game was a big hit! ... We appreciated that the game was family-friendly, and that it had a good mix of complicated and less-complicated characters to accommodate the players' varied acting abilities. This game was more than worth the cost, especially since I now know where to find an engaging party game whenever I need one!" The students were pretty apprehensive at first and it took some convincing to get them to join the party but once there they all had a great time. The last one I ran, though, turned into a bloodbath from the get-go but I didn't have much control over that. The highlight was when one of the players, who was running around attacking people, failed to get his intended target to take a drink he had poisoned and, forgetting he had poisoned it, drank it himself." "I have been doing murder mystery parties at my place for at least 6 or 7 years now and in that span of time about 9 games or so, and I have to say hands down that your approach these types of games is the best. The flexibility is great with how everyone can essentially do what they will with their characters since there is no pre-defined script to follow. Just now I have purchased the A Dead Man's Chest game and I am looking forward to matching up my friends with the given characters. Again great games and thus greatly appreciated." "The game [A Dead Man's Chest] was fantastic, I did it for my son's 13th birthday party and everyone had a fab time. It was a lot of work beforehand, reading all the instructions and getting all the pack together, but between my husband son and me, we got it sorted. The worst problem was that two people cancelled, one the day before which was fine, but one person just didn't turn up -- but as my husband and I didn't have a part, we managed to sort it out." "The format of A Dead Man's Chest was different from what we have done before, but the kids had a wonderful time. They played the game for about 3 hours and were all equally engaged. They have asked that we host another game later this year. " "Wow! What a great evening. I wanted to do something a bit different for my birthday and I had tried boxed versions of Murder Mystery games before but they were nothing like this. A Dead Man's Chest was great and I was so pleased with the effort my friends made in dressing up! They were all really impressed and we will be doing another one for my birthday this year!" "A Dead Man's Chest was very clever, excellently written and we all LOVED the open-ended nature of what people could do. SO much plotting and back stabbing." 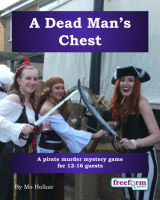 A Dead Man's Chest is a dinner party murder mystery game for 12 to 16 guests and a host – download the free introductory pdf file. Join us in a thrilling evening of piracy, intrigue, heroism and skulduggery. You will be in the middle of the action and it will be up to you to wheel and deal with the other guests. Can you achieve your goals, keep your secrets hidden and survive A Dead Man's Chest? It's up to you. Two pirate crews descend upon the sleepy Caribbean island of Santo Oloroso -- to avenge the death of their former master Captain Flint, or to find and grab his treasure? Old enmities will surface, deals will be made and broken, and some folk will swing from the yard-arm while others receive the dreaded Black Spot, before these affairs are settled, for good or ill.
Will fortune favour the brave? Will faint heart ever win fair lady? How many Pieces of Eight make a Doubloon? Find out all this and more at A Dead Man's Chest. A Dead Man's Chest lasts for about four hours and is suited to an evening. It is often played over a meal – a finger buffet if possible to allow guests to circulate and talk in private. "Just wanted to tell you that A Dead Man's Chest was an awesome mystery – my friends really loved it. Thanks for a great product!" The free introductory pdf file contains an introduction to the game, a cast list of all the characters, and a copy of the Caribbean Courier – plus details of how to buy the game. A Dead Man's Chest is unlike many murder mystery games. Although the game starts with a murder, most of the characters have more important things to do than to investigate it. And the killing may not be over – it is unlikely that everyone will survive the remainder of the evening! A Dead Man's Chest is played just like a murder mystery game. You may be trying to solve the murder, but primarily you are (initially at least) concentrating on your own goals and objectives. Unlike most boxed murder mystery games, A Dead Man's Chest lets you decide how to achieve your goals and thwart your enemies. "We played A Dead Man's Chest in honor of my 21st birthday and had SUCH a great time! …The next day, the game was the ONLY thing being talked about in the theatre department – everyone was telling everyone how much fun it was, all the funny jokes, everything – it was quite a hit!" On the evening of the game the guests are met by the organizer. They then receive their detailed backgrounds - including dark secrets, objectives and money. The players can form alliances, blackmail each other, steal items and even mutiny. Along the way they may solve some of A Dead Man's Chest's mysteries. Why was the Governor's daughter kidnapped by pirates? Who is the masked do-gooder 'El Cuervo'? Where is the fabled treasure buried? And of course, how did Captain Flint die? Finally, the game concludes and everyone finds out how they did, and what secrets everyone else was concealing. A Dead Man's Chest costs £20.00 (GB pounds) or US $29.99. You can buy it in either currency, from anywhere in the world, as you prefer. The price will be converted back into your own currency for you, at today's exchange rate. We offer a Cast Iron Guarantee on all our murder mystery games. If you're not completely satisfied with A Dead Man's Chest then please let us know within 30 days and we will refund you. See our full terms and conditions here.